Those crazy craftin' kids - Stop staring and start sewing! I'm truly grateful that my daughters like to craft. They get invited to a lot of birthday parties but I haven't had to buy a gift for a couple of years now. I have a wicker basket where I toss all my too-small-for-me-but-too-big-to-throw-away fabric scraps and they're very skilled at making fun and magical things with them. My 14 year old (who just had her birthday yesterday and I can't believe she's 14 already!) 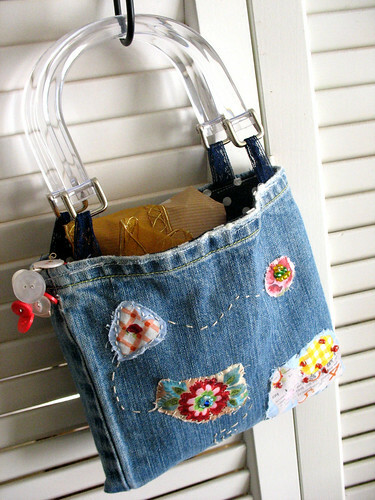 made this darling purse for one of her friends. 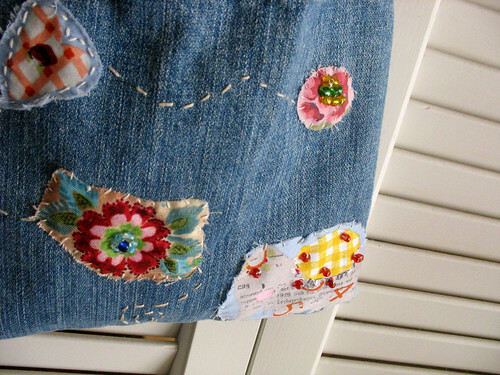 She took the bottom of the leg from a pair of jeans, some fabric pieces, some beads, some embroidery thread and lots of imagination and voila' (or walla!)! She also made this jingly little button bracelet and I don't know what's in the gold wrap, it could be limburger cheese for all I know (but the wrap sure is nice!). I think her little friend will be tickled to get something so cute and made-just-for-her (except for the limburger, I'm not sure how that's going to fly). That's an elephant in the lower right-hand corner (from an IKEA duvet that I fell in love with). The checked heart came off the same fabric and the big flower is from some Tracy Porter fabric that I absolutely love (and Jo-ann's carries it). Ca-ute! I'm going to keep those girls very busy during Christmas break. And maybe I won't have to buy ANY gifts at all!! Oh and I'm cleaning out my Christmas stuff on ebay for low, low, low prices (make an offer, I'm feeling very "flexible"!). I have something super fun planned for my last big get-that-sewing-machine-before-Christmas ebay push (my goal is to list them this week). If you like Heather Bailey (and really, who doesn't?!) you're going to love this!